On Mars, the diversity of volcanic rocks — and the complexity of volcanic processes — rivals that of Earth. 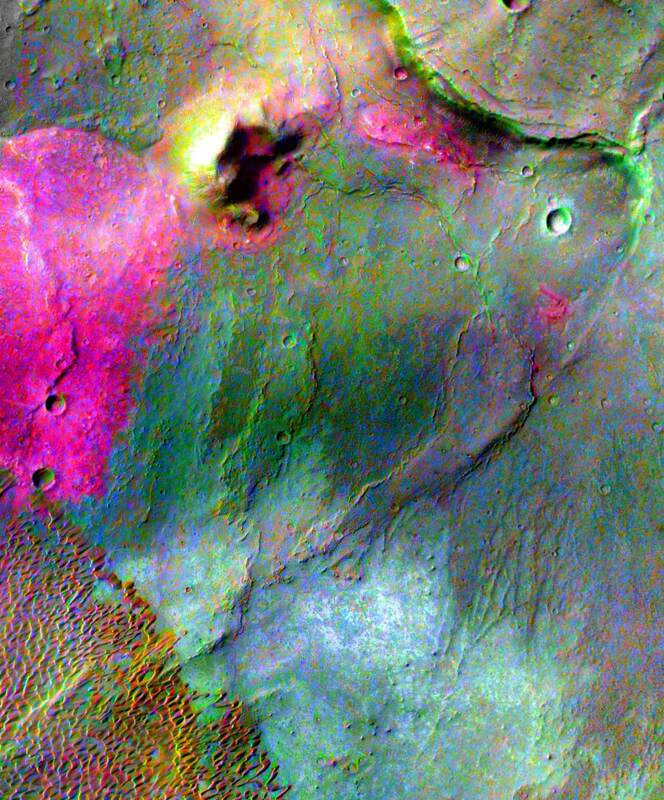 Imaging by the Thermal Emission Imaging System (THEMIS) on the Mars Odyssey spacecraft in the infrared has revealed a remarkable diversity of igneous materials, from olivine-rich basalts to high-silica dacite lavas to granitic rocks. On Mars, volcanic evolution has produced lava compositions that range from low-silica basalts found in many locations to high-silica dacite and granite in the Syrtis Major volcano. On Earth, basalts are found on the ocean floor, islands like Hawaii, and flat volcanic plains in Washington, Oregon, and India. Dacites can be found associated with more evolved classic volcanoes such as Mt. Hood and Mt. Fuji. The existence of dacite on Mars demonstrates that highly evolved lavas have been produced, at least locally, by magma that undergoes crystal fractionation. Olivine basalts are observed on martian crater floors and in layers exposed in canyon walls up to 4.5 kilometers (2.7 miles) beneath the surface. This suggests that olivine-rich lavas were emplaced at various times throughout the formation of Mars' upper crust. Quartz-bearing, granitoid rocks have also been discovered in Syrtis Major, demonstrating that extreme differentiation has occurred. 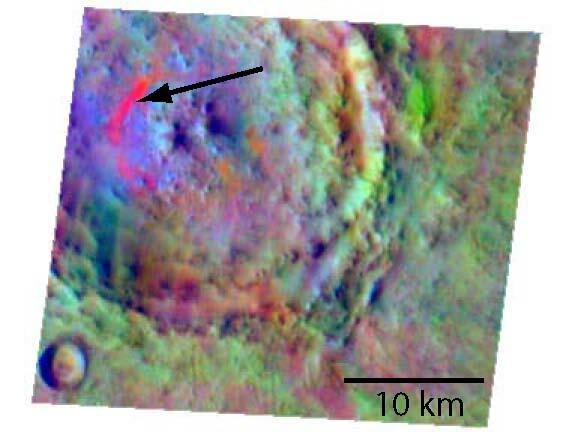 These observations show that the martian crust, while dominated by basalt, contains a diversity of igneous materials whose range in composition, from picritic basalts to granitoid rocks, rivals that found on Earth. Streaks and patches of false-color red mark exposures of quartz-bearing rocks that resemble terrestrial granites. The discovery by THEMIS of this rock type marks a first and implies Mars has undergone volcanic evolution. The scale bar measures about 6 miles long. Figure adapted from Bandfield et al., 2004.